Can a coastal plant ecologist quell a minor social media uprising? 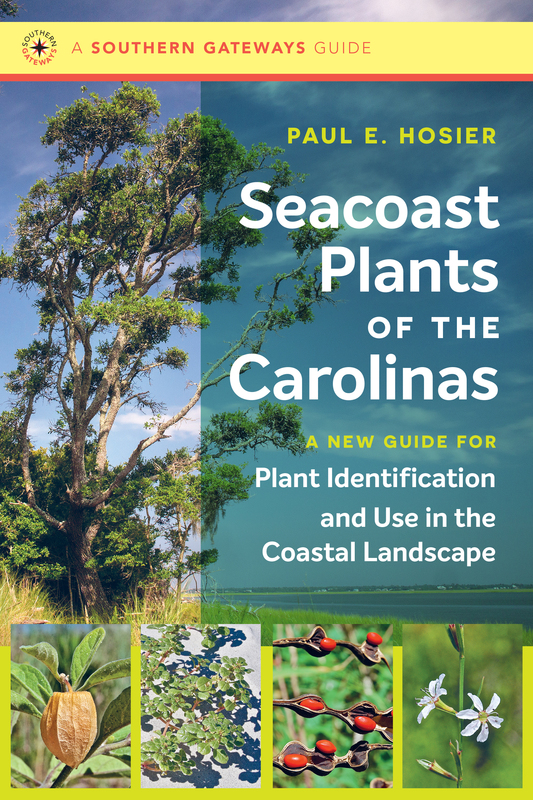 Paul Hosier is the author of Seacoast Plants of the Carolinas: A New Guide for Plant Identification and Use in the Coastal Landscape. 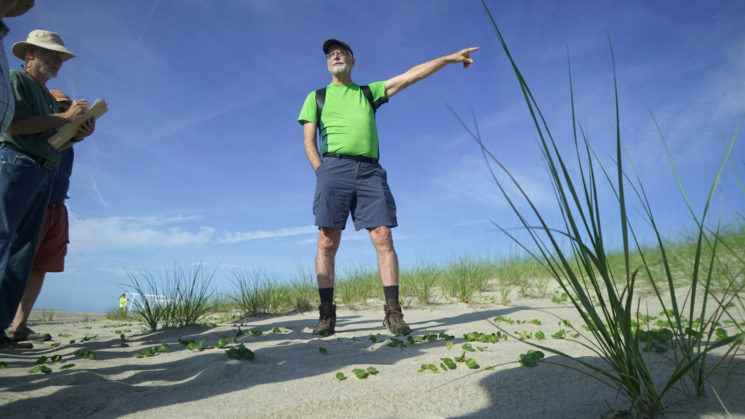 He also is professor emeritus from the Department of Biology and Marine Biology and former provost at the University of North Carolina Wilmington. Here, he explains what happened when new research necessitated renaming one of our favorite plants — and he points us in the right direction. His blogpost also appeared in the Spring 2019 issue of Coastwatch magazine. The N.C. Office of Environmental Education’s Twitter feed opened the floodgates when they spread the news that scientists had changed the name of smooth cordgrass. In a presentation at the N.C. Museum of Natural Sciences Nature Research Center in Raleigh, North Carolina, I cited a new Latin binomial, Sporobolus alterniflorus, for our well-known smooth cordgrass, Spartina alterniflora. Attendees met the citation with expressions of surprise, angst, disappointment, disgust and disbelief. During their entire careers, some spanning 50 years or more, coastal ecology researchers have extolled the fundamental importance of several species representing the genus Spartina to coastal ecosystems in the Carolinas and, indeed, the entire Atlantic and Gulf coasts of the U.S. Clearly, this new nomenclature is a major change in how we cite our cordgrasses. With a somewhat imperfect analogy, you probably would express similar responses if a childhood friend, Meg Jones — as she reached adulthood and married — preferred that she be called “Margaret Smith.”She is, and always will be, “Meg” to you. Recent DNA-based phylogenetic studies of the grass subtribe Sporobolinae found that several well-known genera — including Spartina — were more appropriately placed in the genus Sporobolus, and following the rules established by taxonomists, necessitates that the genus Spartina be discarded (Peterson, et al., 2014a; Peterson, et al, 2014b). The scientific community continually engages in taxonomic research, and results of individual studies are published as quickly as possible, usually within a few months to a few years following an investigation. Conversely, floras, books and other user-friendly expressions of taxonomic research are produced at a much slower rate. Decades may pass before new floras incorporating the changes established by taxonomic research appear in hard copy. Note that the Flora of the Southern and Mid-Atlantic States (Weakley, 2015) now replaces the familiar Manual of the Vascular Flora of the Carolinas (Radford, et al., 1968) after a span of nearly 50 years. Weakley’s flora makes the change from Spartina alterniflora to Sporobolus alterniflorus. Seacoast Plants of the Carolinas was one of the first popular publications to use the new nomenclature. In perusing the Flora of the Southern and Mid-Atlantic States, note that the Spartina-to-Sporobolus change is not the only recent change. Ampleopsis arborea is referred to as Nekemias arborea, Polypodium polypodioides is now Pleopeltis michauxiana, and today, Chloris petraea is Eustachys petraea. Changes to these and many other lesser known plant names has gone all but unnoticed but represents, and is the expression of, our accumulated knowledge about the phylogenetic relationships amongst plants. 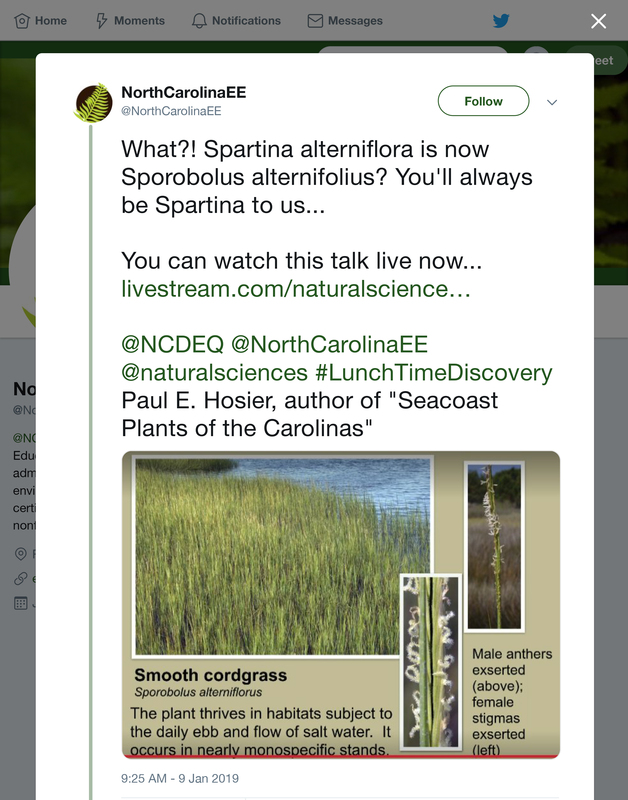 While our long-time friend will always be “Spartina” to coastal ecologists, new and future coastal scientists will be introduced to Sporobolus. They may know little or nothing of its past name, and Sporobolus alterniflorus will become one of their favorite plants! Over time, we, Spartina’s old friends, will come to understand and appreciate that the new plant name is based on our current understanding of its relationship to other plants. Paul Hosier’s “Seacoast Plants of the Carolinas” talk on January 9, 2019 was part of the Lunchtime Discovery Series, a partnership between the N.C. Office of Environmental Education and Public Affairs in the N.C. Department of Environmental Quality and the N.C. Museum of Natural Sciences. You can watch it here. Lead photo: Paul Hosier, by Gary Allen. Hosier, P. E. 2018. Seacoast Plants of the Carolinas: A New Guide for Plant Identification and Use in the Coastal Landscape. Chapel Hill: University of North Carolina Press. 492 pp. Peterson, P. M., K. Romaschenko, Y. H. Arrieta, and J. M. Saarela. (2014a). A molecular phylogeny and new subgeneric classification of Sporobolus (Poaceae: Chloridoideae: Sporobolinae). Taxon 63 (6): 1212-1243. ___________. (2014b). Proposal to conserve the name Sporobolus against Spartina, Crypsis, Ponceletia and Heleochloa (Poaceae: Chloridoideae: Sporobolinae). Taxon 63 (6): 1373- 1374. Radford, A. E., H. E. Ahles and C. R. Bell. 1968. Manual of the Vascular Flora of the Carolinas. Chapel Hill: University of North Carolina Press. 1,245 pp. Weakley, A. S. 2015. Flora of the Southern and Mid-Atlantic States. Working Draft of 21 May 2015. University of North Carolina Herbarium, Chapel Hill. 1,320 pp. « From Floyd to Matthew: Vulnerable Populations Respond to Flooding in Eastern N.C.